4 pegant Road Twilley Road Kenilworth 7700 Cape Town South Africa, Cape Town, South Africa. Maxim Kids is a registered South African NPO ref: 149-955 NPO. 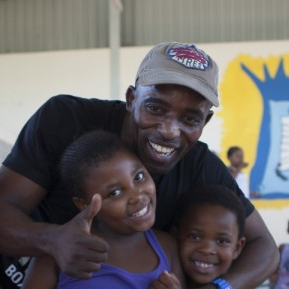 The organization aims to provide under privileged kids from across South Africa, and Africa, with a safe environment in which they can be uplifted and kept off the streets. Maxim Kids will provide a structured system through primarily boxing, but we will also incorporate other suitable sports to keep the kids engaged and motivated. Our development programme will be a duplicate, and will be rolled out throughout South Africa and the African continent. Maxim Kids will offer other skill sets, for example life skills, education and artisanship. Maxim Kids will be building sports and education training facilities to provide a structured, safe environment for the kids. Maxim Kids partners with existing community programmes, and helps create new programmes where there is none in existence. In this way, Maxim Kids empowers communities. Maxim Kids’ programmes serve primarily vulnerable youth aged from 5 to 17 across gender spectrum (covering both male and females), who are living in under-privileged areas of South Africa and in the continent at large. Exceptions may be made for youth immediately under or just over those ages on a case-by-case basis. Maxim Kids teaches the traditional boxing technique, incorporating a strong work ethic in its teaching model, and well as various life skills. The positive effects/outcomes of Maxim Kids’ programmes can be measured in terms of the personal developments of its participants. Like most sports, boxing requires discipline. However, its uniqueness emanates from the fact that, by its very nature; as unlike collective sports, boxing a high level of and focus at all times. Successful participants of the programmes are those that are able to develop that discipline and focus and ultimately extend that discipline to other areas of their lives. Sports in general offer a chance for youth to be challenged and grow, developing confidence in themselves and in turn raising their self-esteem. Our programmes and activities are structured in a way to boost the youth’s self-esteem and confidence; especially for young girls, who happen to be the most vulnerable in the underprivileged communities. Our programmes make turn boxing into a very enjoyable hobby, especially for young girls, who are not socialised to get involved in such sports. Maxim Kids programmes offer an environment where youth will be challenged to participate in a very demanding sport and at the same time learn respect, not only for their peers that they train and compete with, but most importantly for themselves. Successful participants are the ones that, through our programmes, find new confidence in themselves through adopting the positive attitude necessary to endure and to be successful in the sport of boxing while at the same time developing respect for the sport and others both in and out of the ring. We at Maxim Kids would love to hear from you!